If Insight is unable to locate any of these files while loading a session, you will be presented with the Missing Files window. The window displays a list of files, previously used in the session, which Insight can no longer find. network access to the storage location is currently not available. 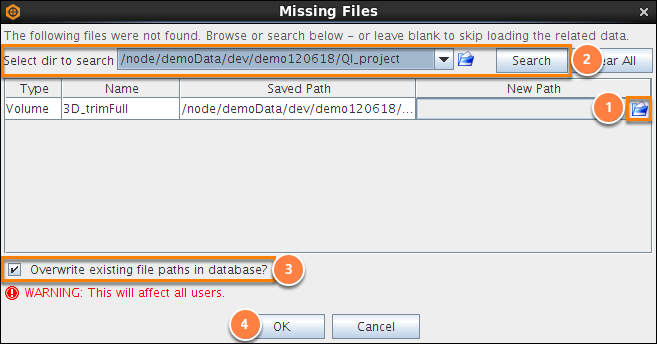 If the file has been renamed or moved, a new name and/or path can be manually specified. Click on the Open Folder icon at New Path, browse to the new file name/path and click Open. If the file has simply been moved to a different area of the network, and retains the same name, you can Select the directory to search and click on the Search button to locate it. Once located, you can choose to Overwrite existing file paths in database. This will permanently overwrite the previous reference with the new path, and will affect all users of the project.